After a particularly difficult and odd delivery, Adijan returns home satisfied she's finally made enough to settle her debts and start up her empire, to find her darling gone. Her brother-in-law, an arrogant and grasping merchant, has taken her away and begun divorce proceedings, in order to marry Shalimar off to someone who will benefit him. He's convinced that Shalimar is simple minded, and even if he thinks otherwise, he doesn't particularly care. Unfortunately, Adijan is lowly, powerless, and a bit too well known for being gone for weeks on end and spending any spare money on drink. 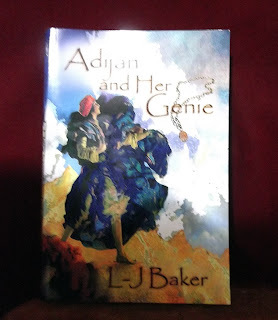 Her aunt, who runs the brothel she grew up in, and the man who loves her aunt (a bubbly, slightly over friendly man named Fakir), do their best to pick her up, hold her back and clean her up again as she charges out in one mad attempt after another to try and rescue her wife. The way the world works in her city is strongly in favour of bribery, so she goes to try and collect payment from an enchanter she just finished working for... except he's dead, and his widow is quite unreasonable, throwing the apparently cheap trinket Adijan delivered to him in her face, and her out on the street. Which starts a desperate Adijan on a series of attempts to get some kind of payment for the necklace from pawnbrokers and the man she originally collected it from. Only it's apparently hers for 'as long as she lives' and worthless. This was a fast moving book (mostly driven by Adijan haring off on a new scheme, or reacting to something else), a great deal of fun, and the clash of personalities (and class warfare) between 'Honey Petal' and Adijan was a hilarious and fascinating contrast. Both these characters ended up growing as people - one learning that poor people might actually be people, the other maturing a bit, and - despite spending most of the book inches away from absolute disaster, and finally making a terrible sacrifice, and risking the remainder of her heart and future, Adijan does win through in the end (as of course, any good fairytale character must) and achieves something better (not necessarily 'more', just better) than her wildest dreams. And of course, Shalimar gets her oranges. Love, love, love this book and would heartily recommend it to anyone who likes fantasy, regardless of their interest or lack of, in lesbian romances and characters. 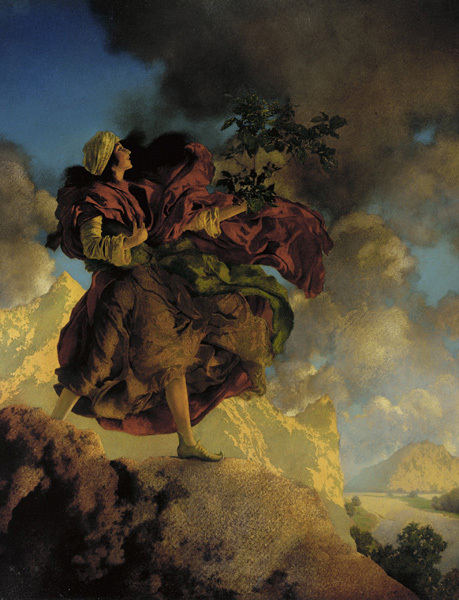 Interesting fact: The cover art (by C. A. Casey) is based on 'Princess Parizade Bringing Home the Singing Tree', an 1889 painting by Maxfield Parrish. And by 'based on', I'd say 'fairly blatantly copied' and/or rasterised and filtered in Photoshop - but it's fifty times better than the cover art on the first two books. Princess Parizade (which means 'child of the genii') is a girl who dressed as a man and went on a quest after three magical treasures, from 'The Story of Two Sisters Who Were Jealous of Their Younger Sister', a story from the Arabian Nights, which can be read here. There's not much I can add, but not out of not enjoying the book. On the contrary, this was my favourite book written by L-J Baker so far as well. Likeable, interesting characters and the interaction between them made it an enjoyable read. Lending this book to a friend with an Arabic background led to a less favourable reaction. They were kind enough to write us a short guest review here. Buy Adijan and Her Genie on Amazon (paperback or Kindle ebook).